Similar But Different are, left to right, Charlotte Fassler and Dani Girdwood. 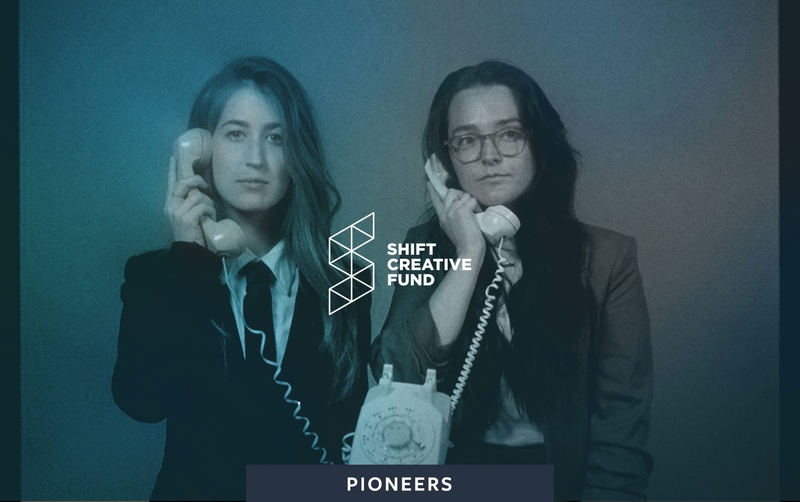 Before officially launching the SHIFT Creative Fund in the spring, we awarded Pioneers, an all-female, production-ready indie short with a small seed grant. Ever curious and excited about the creative process, we asked the team behind the film to send us dispatches during its development. The first installment came from SLMBR PRTY, the company producing Pioneers; this one finds Similar But Different, the New York-based director duo of Charlotte Fassler and Dani Girdwood, sharing their experience of shaping the film, complete with the challenges of location and the rewards of a well-acted scene. Let’s listen in. We’ve been back in New York for a few weeks and feel so lucky to look back on this whirlwind of a production — an adventure every step of the way. We flew to Los Angeles three days before our shoot and dove head first into prep. The entire week was a nonstop marathon for everyone involved; it was very hard to find time to catch our breath. But now, looking back from the comfort of our edit bay, we finally have a minute. There are so many feelings swirling: relief, pride, appreciation, shock and awe. We’re so blown away by how everyone believed in this thing — and feel so humbled to have made this all together. We knew going in how special this team was — SLMBR PRTY and Allison Anderson and our brilliant actresses and everyone else on board — truly the dream team (as cheesy as that sounds). But there’s something to be said for that special moment on set, when there’s a lull in the chaos, and you look around and realize how lucky you are to be working with such superhuman talent. The most tour de force assembly of young guns — that blows your mind no matter what. We also had no way to anticipate how challenging the heat would be. In the week leading up to our shoot, we found out that Borrego Springs — usually a comfortable 85°F during the springtime — would be in the middle of a maddening heat wave during our shoot. On both days, temperatures hovered around 108°F in the middle of the desert with very little reprieve. There was no way to anticipate how that would feel — how it would affect our ability to think, problem solve, and be creative. We panicked and picked up the proper survival gear at REI ahead of time. The two of us donned matching extreme weather gear ensembles and worshipped our cooling towels, brilliant little shamwow bandanas that help lower your body temperature — a saving grace. It’s so hard to pick a favorite moment from this shoot but, for us and the SLMBR PRTY team, was a scene we shot in the dried lake basin. It was the middle of the day — sun high in the sky and beating down, the hottest it was the entire shoot — and we dove into this emotional duel between these two women. At lunch, just before traveling out to the location on the ATUV (all-terrain-utility-vehicle or a super gator), we’d had a pretty thoughtful and emotional talk with our actresses about what the moment means for their characters and how to push that moment to the breaking point, a rock bottom of despair. In that talk, we explored some new corners of the story and beats to try — all new elements that had us giddy (but also anxious) about how this scene might play out. There were so many places it could go to. It would be a matter of trusting emotional instinct in the moment (a 108°F moment, which is a lot to undertake). The first shot we fired off was from the top of the ridge looking down at Cora’s character discovering the lack of water for the first time. The jaw-dropping expanse, partnered with Bianca’s hysterical performance, is one of the most gut-wrenching images we’ve ever witnessed on set. It sucked the air out of your lungs to watch. It left members of our crew in tears. And that was just the tip of the iceberg as we dove in to discover that heartbreaking scene. In playing with the sound design and constructing the pacing of these scenes with our incredible editor, Stephania Dulowski, our hopes from this film have become so clear: We want it to be a gut punch. Something textured and swelling in the way you hear it, see it, and feel it. We want these characters to seep into your consciousnessand yet still sneak up on you with a sharp, whiplash twist. Right now we’re focusing on building that tension and executing the trigger moment to be as effective as possible.